Governments across the world have recognised the potential of new information and communication technologies (ICTs) to bring about fundamental renewal in not only government and public sector processes, but also their relationship with civil societal groups, the private sector, citizens, and various other actors. ICT provides enormous opportunities to increase efficiency and effectiveness in all kinds of policy sectors, and promises a real dialogue between policy makers and the public. This second edition of the prescient and influential work first published in 2001 includes updated texts of several chapters from the earlier edition as well as various chapters, among them a number of country reports written for the e-government session of the of the 17th World Congress of Comparative Law. In addition to visions of the concept of electronic government, it provides examples of already active electronic governance by including various chapters on developments in the United States (both federal and state), the United Kingdom, Canada, Germany, Italy, Denmark, and the Netherlands. It draws valuable lessons (cross-national, between policy sectors and across administrations) from the design of electronic government and from evaluations of electronic government in practice. obstacles and dilemmas touching upon security, surveillance, identity fraud, liability, intellectual property, free access, national security, equality, and privacy. 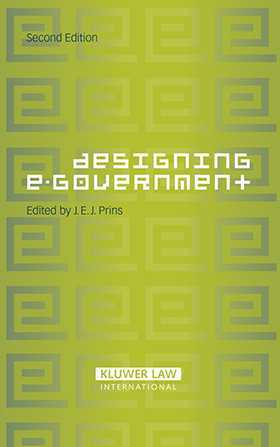 Especially in its close attention to the interaction between legal, practical, public administration and ethical obstacles and dilemmas, Designing E- Government, Second Edition is of enormous value to practitioners, officials, and policymakers concerned with the legal implications related to the design and implementation of e-government, and with the present and future challenges of this endeavour.